Definition at line 435 of file conmsg.h. Definition at line 437 of file conmsg.h. Definition at line 439 of file conmsg.h. Definition at line 438 of file conmsg.h. 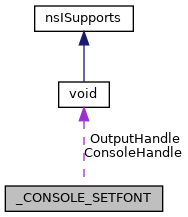 Referenced by CSR_API(), and SetConsoleFont().